How do you feel about it? I’m not in favor. Seems like it would decrease excitement. It should help us since we don’t defend it. 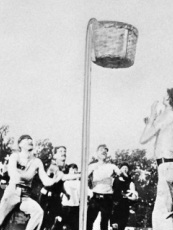 and they should lower the basket a foot for WBB for more hot dunking action! Women’s basketball players? No, Not hot. NOT HOT. The dancers and cheerleaders, yeah pretty much. and make the shot clock 15 seconds. After all, most folks want to see running up and down the court, dunks and 3 pointers! They aren't interested in anything else. Just for kicks, give five points for any shot made from beyond half court! I think the whole court needs to be bigger and the rim raised up at least six inches. The players have evolved but the court has not. NBA players look like they run the floor in 10 steps. Every waterboy can dunk. Let's modernize! in a clockwise circular fashion in order to create more all round difficulty...The GAme is fine, leave it alone. This isn't an Apple Iphone where you have to create updates just so people have something to do. Not directing this at your comment, but just in general.